29th April – A Call To Arms! Hammersmith Chess Club – we need your help! 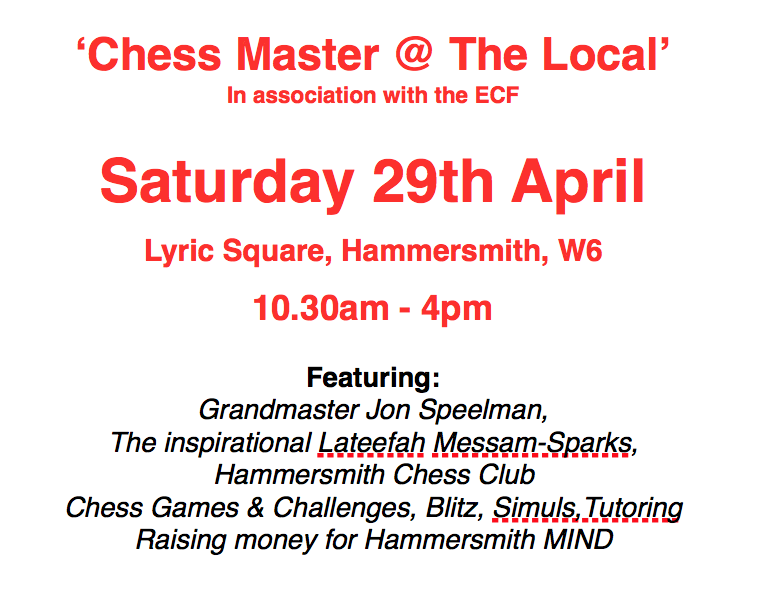 We are super excited to be hosting the latest round of the ECF’s “Chess Master @ The Local” initiative on Saturday 29th April, at Lyric Square in Hammersmith Town Centre. It’s a fantastic enterprise designed to raise the profile of the game and engage the local community – the ECF have supplied us with one of England’s finest players GM Jon Speelman for the event; we have also secured the services of the inspirational Lateefah Messam-Sparks for the day too. It promises to be a terrifically fun and engaging day of chess in the heart of West London, and is a fabulous opportunity to raise cash for the worth folk of Hammersmith MIND charity, as well as the profile of our 55-year old club. However, none of this is possible without our Club Members – and we’re asking for your help. The more of us who get involved, the better – we already have solid commitment from 8 of our players for the day, but we need more! Any offer of help – no matter how small or large – is HUGELY welcomed. We need people to help with: logistics, setting up, handing out fliers, taking on the public in chess matches, putting up posters to publicise the event, helping carry equipment over from the club. You needn’t commit to the whole day, just an hour or two would be amazing. We are also in desperate need of a gazebo (you know what the British weather is like on a Bank Holiday!!)! If you have one we can borrow for the day (it will be treasured and returned in pristine condition!!) that would be brilliant – even better if you can help bring it to Lyric Square! From the entire club – thank you in advance! !